Relationships are critical in business and working with a variety of people with a range of different skills just makes everybody’s job better. The same is true for you and your company’s leadership team. Learn more about how your business can benefit with a second-in-command. From the minute you open your doors in the morning until the time comes to close up shop at night, running a successful business means that everybody has a job to do and everybody’s job is critical. Unfortunately, this fact just makes it that much harder to recover from the sting of losing a critical employee unexpectedly. Instead of equating the loss of a vital employee to a ‘Doomsday’ scenario, consider the many benefits associated with cross-training. When you cross-train your employees, you are giving them the opportunity to invest in their own professional development; in doing so, they become more confident, knowledgeable and driven to deliver exceptional results. The following are just three more reasons why implementing a cross-training program can help drive the long-term success of your company. WELL-ROUNDED KNOWLEDGE: Employees develop a wide range of skills and a general understanding for topics across various industries. 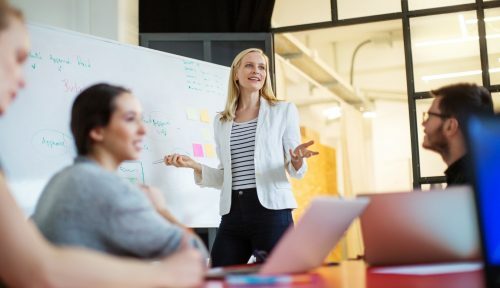 Additionally, when you invest in the continued education of your employees, you are actively helping to build an even better working environment, one where professional development is valued. In turn, your team is more apt to develop stronger relationships with their clients. INCREASED UTILIZATION: When employees have a broadened understanding of different roles and responsibilities in the company, they are more likely to collaborate and assist others when needed. This widespread understanding throughout your company can even help you reduce your labor costs. Instead of bringing on a new employee for or a temp to handle the overflow, you can count on your cross-trained employees to help pick up the slack where needed. EASIER RECOVERY: Cross-training allows you to shift resources in a way that allows optimal efficiency and greater strategy. If one of your employees does move on, the beauty of utilizing a cross-trained staff means that your hiring process can be more thorough and strategic, rather than jumping at the next applicant to send in a resume. Continued improvement is the name of the game when it comes to establishing a cross-training program. Encourage your team to think outside of the box to identify ways to improve efficiency. Relationships are critical in business and working with a variety people with a range of different skills just makes everybody’s job better. The same is true for you and your company’s leadership team. Every great leader has had a second-in-command. It’s arguably the most important role within any company. Why should you consider naming a Robin to your Batman? With the knowledge and skills needed to stand-in for you when you’re not available or are travelling for extended periods of time. Who brings out the best qualities in you, while helping make up in areas in which you struggle. Can be ready to fill your shoes and allow for a smooth transition for your business when it’s time for you to retire or move on. What are you doing to encourage employee development in your business? Could you be doing more? Our team is always happy to help offer suggestions to help you establish a cross-training strategy. Let us know how we can help. This article was featured in the summer edition of The Rea Report. Are you currently receiving our quarterly print newsletter? If not, click here to subscribe.